I didn't get any trail time when I was testing just to keep the pipes clean. I know it wheelied very easily before with little throttle effort. 70+ rwhp you'd expect that!! John can you give some tuning tips for the auto tune such as where these pipes are making the best hp A/F wise and at what rpm's peak hp occurred. Yes, I am seeing peak power at 7250 rpm and 12.7-12. a/f ratio. I got my renegade setup with them on it with modded shorty cans. what a sound..... the vid doesn't really capture the sound as deep as it is. Looks good so 12.7-12 range on A/F. Thanks. 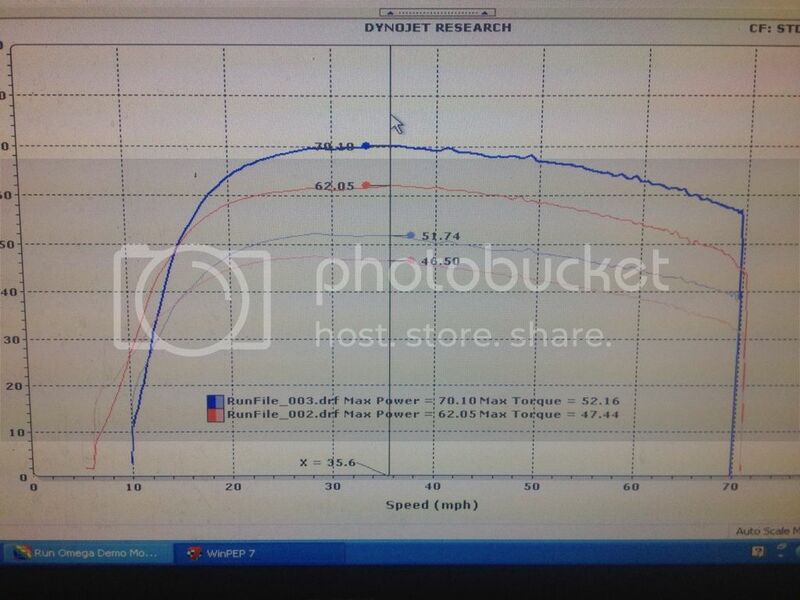 there's the chart of the Dual Muzzys VS stock exhaust. I'll post the dyno videos as well soon as they upload. stock dyno, muzzy q-core and sparky, and wide open. you'll be suprised to know, it made the most power peak with q-core and sparky INSTALLED!! I have charts of the cores installed vs wide open. cores in, it makes a hair more low end, cores out it makes a hair more top end. Curious your thoughts on the rotax motors.....800 and 1000 vs the kawi 750 twin. Which is better in what areas....and why? I think others are probably curious too.....I mean the brute is making a lot of power with a tuner and exhaust and clutch work. Can the 800r match it mod for mod? is there something about the degree of the V in the engines that makes one better than the other? I am not all that suprised with the better performance with the duals plugged up a bit. I tested a lot of different pipes and setups on the original 800HOs and the woods was the most free flowing making slightly more HP but fell short on torque compared to a slip on HMF. I would be like to see how a sinlge open ended can would compare to the duals with inserts in it. Based on your conclusions, and what I have experinced I would not be susprised if a singe can wouldn't perform just as well if not better. Duals are cool though, and those look and sound great on there. With 26" Bighorns, on Black 12" ITP Rims, rear Can-am box, and HD front Can-am bumper. with Bighorns on 14 inch Hipers, Handguards, storage boxes, backrest, Sport bumper, Pia lights, 35oo# Winch w/wireless remote, rear work lights. 11 Sportsman Touring 850 LE, 09' King Quad 750 W/PS,08' Polaris Sp800 X2 \ 09' Outlander 800R \ 08' ThunderCat 1000 \ 06' Diamond G Outy 800 \ 08' Honda Rincon 680 EFI \ 08' Polaris 800 RZR \ 07'Renegade 800 \ 06' Outlander 800 XT \ 06 Outlander MAX 800 \ 05' Polaris 800 Sportsman \ 04 Susuki Twin Peaks (Kawi prarrie) 700. They do have a single can also 2 into 1. Muzzy said it makes 2 less @ 6-rwhp but this information came from a third party. Don't think John has actually tested it yet. Thats cool, is it a slip on or full system? I had just herd and seen first hand on occasion how too much flow can sometimes take power away, seems that might be case here, if adding the incerts increased the power some. I am just kinda interested in seeing how a simple slip on single can compares. I know the swamp series was a joke on the 850XP I tried it on, so when I herd thats all they had for the 1000, I have been setting back waiting for some more choices to hit the market before jumping in and buying something. I see from scanning through some post on here today looks like there is getting to be some options availble now. So far I like this muzzy setup the best from what I have seen so far. Just not seen to many duals that accually out perform a an open single. But it has always seemd to me its about getting that good balance of flow and back pressure just right. The duals with the incerts may be that perfect balance.